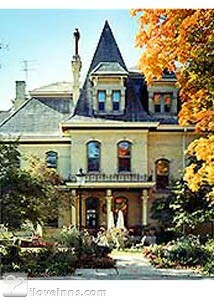 Oconomowoc bed and breakfast travel guide for romantic, historic and adventure b&b's. Browse through the iLoveInns.com database of Oconomowoc, Wisconsin bed and breakfasts and country inns to find detailed listings that include room rates, special deals and area activities. You can click on the 'check rates and availability' button to contact the innkeeper. Historic Oconomowoc, Wisc. is conveniently located off I94 between Milwaukee and Madison in Wisconsin's Lake Country Region. It features two beautiful downtown lakes, many gorgeous homes, great shopping (in Oconomowoc, Delafield and nearby Johnson Creek), diverse restaurants, a wonderful antiques mall and a warm quaint atmosphere. It is a short drive to the Kettle Moraine State Park, the Glacial-Drumlin trail, Ten Chimneys and Old World Wisconsin. By Pleasant Street Bed and Breakfast. Oconomowoc is a city in Wisconsin which has so many attractions to boast of. When it comes to activities that can be done outdoors, this city is offers so many options. These include hiking or biking along the Glacial Drumlin Trail, cross-country skiing at Nashota Park during the winter or hiking in summer. Alternatives for the same activities near Oconomowoc are Kettle Moraine Park and Lapham Peak. Other attractions in the city are Miller Park, Ten Chimneys, The Octagon House, Old World Wisconsin, Pabst Mansion, Holy Hill, and Retzer Nature Center. In the evenings, guests at Oconomowoc bed and breakfast inns may go out for a few hours to watch movies at Hillside Theaters or live performances at Fireside Theater. Being a vibrant city, Oconomowoc surely has many shops where visitors can buy their souvenirs. These include Tobin's Gifts, Old Lynndale Farm, Gathering Place, Fox Antiques, Beverly Designs, Accentuate, and Ben Franklin. By The Inn at Pine Terrace.